Knots in the middle of a skein. Aren’t those just the worst? Yes. And they always do seem to be in the very worst place of the project. It’s annoying and frustrating. Maybe you’re thinking there is a lack of quality control from the manufacturer. But knots happen, even to the best yarns. So, what do you do when you come across a knot in your yarn in the middle of your project? The first to do when you discover a knot in your work is to analyze whether the knot is strong to continue. 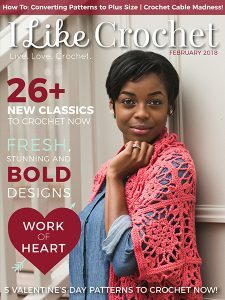 If the knot is stable and won’t unravel, keep crocheting. If the knot is not secure and you think it might unravel, you can break the yarn, redo the knot and then keep going. In some cases, you might have to rip back to the beginning of the row, break the yarn, cut out the knot, rejoin the yarn to the project and then continue working in pattern. While knots can be irritating when they pop up in your project, there are some quick and easy ways to get past the. For yarns that are made using 100 percent animal fibers, you can join invisibly with the spit splice method. In this method, you break the yarn at the knot, dampen both ends, and then overlap the yarn ends while rubbing them between your fingers. The friction caused by your fingers combined with the added moisture will then felt the two ends together, joining them invisibly into one continuous piece. This join can be a little stiff because the fibers are felted and a bit thick. For acrylic, cotton, linens and non-wool yarns, the spit splice method will not work because these fibers will not felt. In this case, there are a few things you can do. One method, which is quite simple is to break the yarn to remove the knot, overlay the two ends 4-6” over your work and then crochet over them. Another method, which will take a bit more work, but looks absolutely seamless, is the Russian Join. The Russian Join method is a clever way to graft two ends together by weaving the end into the strands of yarn rather than into the fabric, like you would at the end of a project. The way the Russian Join is worked is to break the yarn at the knot and then thread a sharp sewing needle with the yarn. When you have about 10” of yarn remaining, run the needle back through the center of the yarn about 3 to 4 inches, leaving a loop at the end. Thread the new ball of yarn, pull through the loop end of the first yarn, and then run the needle back through the middle of the new yarn. Remove the needle, pull on the short ends to close up the loops and trim the short ends off. This method can be a bit thick, but smooth and flexible when working on the project. Knots will happen from time to time. There is no right or wrong way to handle a knot in your project. The only thing that matters is how you feel about your project. Take a deep breath to release any stress, and try one of the techniques mentioned to keep your project going. I have had the knot in the middle of my work happen MANY times. Just chalk it up to bad luck. What I do is Frog it back to the begining (or end) of a row, and then add it as if i was making a color change, even tho I really am NOT, Then add the new yarn in and keep on working in pattern. There ya go……….easy peasey. Good luck. Hope this helps out some. I always split about 4 ins. of my yarn cutting out a ply or two depending on the number of plys involved then thread a needle with one end and weave it in and out ofthe other one when I have about 4 ins. woven I then cut any extra yarn and wet my palms and rub that section together. You can then go on knitting and your yarn remains the same thickness through out the repaired section . It cannot be foud after knitting. I would always cut the knot out. That avoids it being visible in your finished work or worse, the knot working loose. Rejoin the rest of the yarn as you would a new ball, then work over the ends or weave then in at the end. It’s a pain, but the finished product will be much nicer. I didn’t know you could basically felt the ends of animal fiber yarns together! That’s so useful to know.